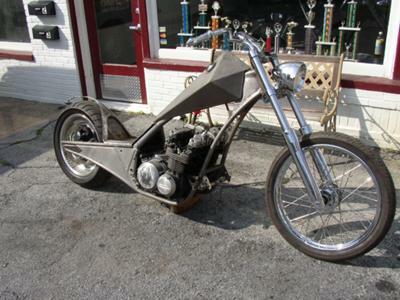 This 1981 kawasaki kz 750 chopper is still in the works: custom frame hand made tank Harley deuce rear wheel, wide glide front end with a jockey shift. I'm calling it the devil's advocate. It's gonna be a little demonic looking. It has a devil's tail seat pan hand fab tank, no store bought stuff here lol and the only thing from the original frame is the motor cradle itself. Everything else is all handmade. It also has a jockey shift, harley wide glide front end with a 5 degree triple tree and a harley duece rear wheel and a 21" wheel up front. oh no im not selling it , you kidding me lol, it's taken me so long to get to this point. im hoping to have it finished by this spring. there is definitely more to come from this .